An obvious "must have" tool belonging on the bench of every gunsmith or armorer who works on (or strips for rebluing) any Colt handgun. The double-ended 1911 Auto bushing wrench feature has been time proven by gunsmiths. Ours handles the traditional Government model with one end and the Colt Officer's ACP with the other. We've all sweated over the mar-free removal and reassembly of the ratchet (ejector/extractor) from the ejector rod of large and small frame Colt revolvers. 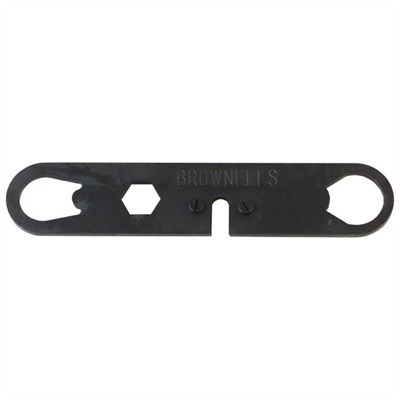 Brownells Colt Wrench handles the operation properly. The hex opening fits over the ratchet of large frame Colts (including old and new Pythons) to hold the ratchet for unscrewing from the ejector rod. For small frame Colt revolvers, the slot with two small studs fits between ratchet and cylinder face; the two studs fitting into two of the ratchet cartridge extractors. The tool ratchet unscrews from rod with no mar or deformations! A lifesaver!! SPECS: Blued steel. 6-1/8" 15.6mm.) x 1" (2.5cm) x 1/8" (3.2mm).